Community volunteer involvement continues for the current O’Keefe Rail Trail project, while contractor’s work edges the trail’s extension forward between Heathcote and Axedale. The Friends of the Bendigo-Kilmore Rail Trail group advises the City of Greater Bendigo Council on various aspects to create a great off-road trail in central Victoria. As well, its members also directly contribute to the O’Keefe Rail Trail’s future facilitates. With table-seat units planned for the trail at various locations, the Friends continue to investigate ways to provide these facilities without solely relying on the Council’s project budget. The result have seen the Friends group successfully obtain funding from various avenues such as community grants, company donations and support. 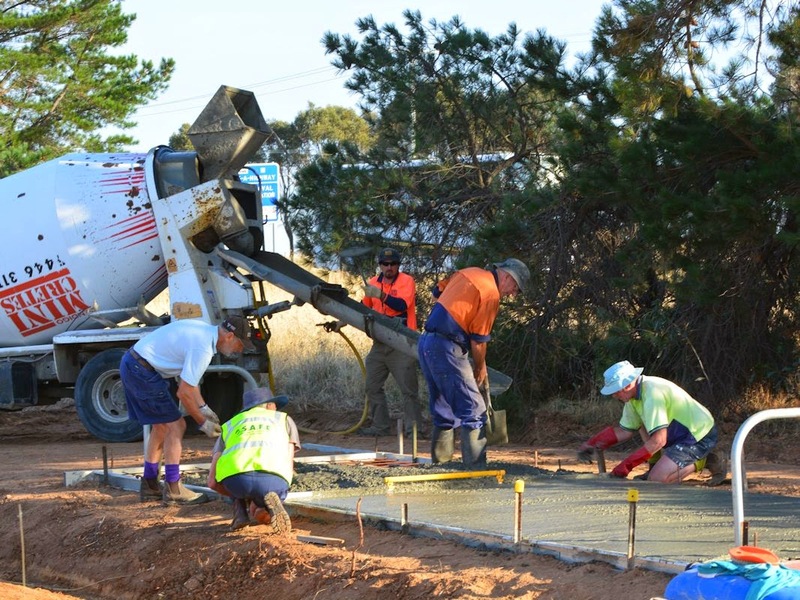 An example of the ‘hands on’ volunteer efforts of Friends members recently was the pouring of a company (Open Space Infrastructure Australia) donated concrete slab. This slab will provide the location for a future trail rest stop, with donated tables and seats plus bike racks to be installed. This will become a great location for the enjoyment of future trail users….as well as a place to catch breath for some!